The year was 1985. Singapore had just discovered its first cases of Aids. At the former Middle Road Hospital, which was designated to handle Aids cases at the time, two doctors resigned and 25 nurses requested to be transferred out of fear, but not Mrs Iris Verghese. "The humiliation connected to the disease was horrible. People did not want to come close to them, let alone touch them," she said, referring to the Aids patients. But Mrs Verghese, a health worker with the hospital, offered comfort and a shoulder to cry on for patients with Aids. She went on to dedicate much of her life to helping people with Aids and HIV, the virus that causes Aids. Over the past three decades, she has counselled countless HIV/Aids patients and their families, as well as raised funds for HIV prevention. Mrs Verghese was recently featured in a short film called Plague, directed by Boo Junfeng and dedicated to the Action for Aids charity. The film is part of the National Volunteer and Philanthropy Centre's 15 Shorts project, which features 15 Singaporeans who went to extraordinary lengths to help others. "I never in my life thought that I would have to deal with a disease like Aids that no one knew much about back then," Mrs Verghese, now 72 and retired, told The Straits Times. She was born in 1946 to a Eurasian mother and a Chinese father and grew up in Kampung Baru. 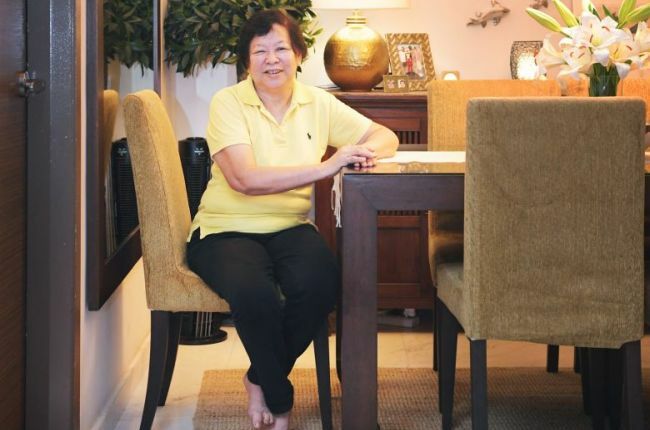 After graduating from CHIJ Katong Convent, she joined the Singapore General Hospital as a nurse and tended to patients such as those with heart problems. She quit her job after getting married in 1971, and gave birth a year later to the first of her two children. In 1974, she got bored and decided to join Middle Road Hospital as a health worker. In her new job, the former convent school girl was tasked with going to Geylang to trace people who had sexually transmitted infections (STI). This often took her to brothels and nightclubs in the red-light district. "If someone has an STI, we will find out who they may have passed it on to. We will trace them at the brothels, nightclubs or homes and ask them to come down for treatment," she said. Mrs Verghese kept a friendly rapport with the nightclub managers and brothel keepers so that she would be able to meet the patients. "Going into the nightclubs, I would always find myself in odd situations," she said, adding that her husband Martin, a PSA training officer two years older than her, would accompany her. She said: "All sorts of things happened in the bars. When they saw me coming, they would switch on all the lights to be alert." Mrs Verghese said it was difficult to tell people they had STI or HIV. She said: "They reacted angrily. One woman at the bar screamed at me. She threw all the vulgarities at me, some that I did not even know existed. I just let them vent. I told them it was okay and that I wanted to help them." Part of Mrs Verghese's job as a health worker was to counsel people who had contracted STI. In 1985, she started to counsel Aids patients as well. "In the early days, I was doing it alone. The doctors asked me, 'Are you not frightened? We do not know anything about it too'. They told me to stop being a hero," she said. The first case she handled was a homosexual man in his early 30s, she said, adding that she will never forget him. "In 1985, they just sent me to him. There was no information, nothing at all about Aids," she added. "He came to me and started crying and he leaned forward. I did the only natural thing, I just held him. I could not push him away,"said Mrs Verghese, adding that her shoulder pads were soaked in tears. "At that point, I remembered how Mother Teresa cared for the lepers but was never infected." The man died about five years later. Mrs Verghese and her husband started a family support group in the late 1980s for HIV/Aids patients and their families to seek comfort and support from one another. Around the same time, she started attending seminars and conferences around the world, in a bid to tackle the stigma and misinformation surrounding Aids and HIV in Singapore by sharing information about the disease. Even after retiring four years ago, Mrs Verghese still catches up with her patients and their families. "When someone has HIV, you have to talk to them about how to live life and how to die," she said. "When the patients died, their bodies had to be cremated or buried within 24 hours. People had no time to even grieve; there was no closure," she said. She added: "I cried so much when they died. They were humans and not just some digits." To cope, Mrs Verghese folded a paper star into a white heart-shaped box with red ribbon for every patient she knew who died. She folded around 800 stars. "I guess the box was like a coffin. It helped me cope," she said. "I kept them for many years. When I retired, I burned them up. It was my way of saying goodbye to them."